A few days ago I was at home hanging a canvas of my kids. This got me thinking that it might be useful to show you what a canvas gallery wrap looks like. For some of you the word canvas and photograph conjures up the idea of something traditional or old fashioned that may not be to your taste. However gallery wraps are far from traditional. 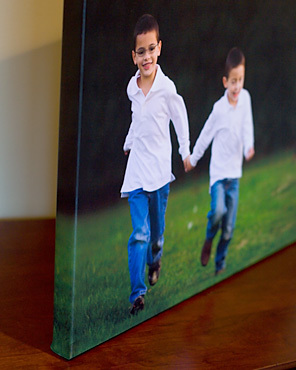 The canvas is stretched around a wooden frame and is ready to hang directly on the wall. They are very modern, look great in both color and black and white and come in a variety of sizes. 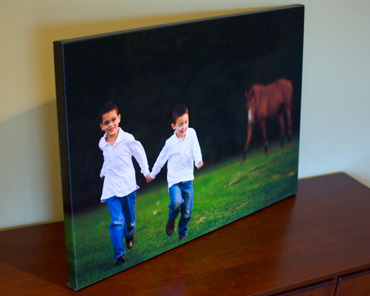 The smaller sizes make wonderful special occasion gifts or for hanging in small wall spaces. Larger wraps can be a great focal centerpiece in a room. Here’s a peek at one ordered by one of my clients. This image looked fabulous as a gallery wrap.